A week later, the ship arrived at the port of destination. The aircraft quickly gathered and circled. When landing on the airfield two Not-51 was damaged. Another Not-51 was lost in their first combat sorties, but its pilot City of Trautloft managed to jump out with a parachute and he survived. During the week German pilots prepare for flight on non-51 a group of Spanish pilots, and already 18 August they made the first combat sorties on the new fighters. On this day, captain G. Morato and Lieutenant D. Salvador was hit by four Republican aircraft Breguet XIX, Potez 54 and two Nieuport 52. Meanwhile, delivery of the aircraft is Not-51-1 for the Spanish rebels continued. During September they were able to supply two full squadrons of the 1st-2 and 2-E-2 of the second aviation group (Grupo 2). Units were based, respectively, in Zaragoza and Leon. In November they were joined by 38 fighters do Not-51-1 of squadron Lagdgruppe 88 of the Legion Kondor. To Nov pilots-51 felt complete masters of the sky of Spain. The situation changed after the appearance of the front of Soviet fighters I-15. 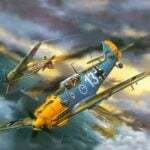 “Heinkels” began to bear huge losses, because inferior to the Soviet fighters not only in speed and maneuverability, but also in weapons: And-15 had four machine guns versus two Not-51 and three times more ammo. On the proposal of the chief of staff of the Legion “Condor” Colonel von Richthofen Not-51 were used for attacks on ground targets, for which the aircraft was modified by installing holders for the six desyatiballnoy bombs. Similar tasks were to perform and the fighters are Not-51 from the second group. Follow the leader, they in turn swooped down on goal, dropping the bombs and firing its machine guns. This tactic, called Cazas de cadena, which literally translates as “chain fighter”. The first such tactic was to use group 1-G-2, formed in Sierra Leone in November 1937 of the twelve fighters do Not-51-1. All in all, Spain was delivered of 79 aircraft modifications. After arriving in Spain new fighter-monoplanes Messerschmitt Bf-109B them armed with the 2nd squadron of Jagdgruppe 88. The first and third squadrons continued to fly on non-51 during the onset of the Republicans under the Brunet, storming the advancing troops at via del Prado. They receive orders from staff officers that are at the forefront of the rebels, or do free hunting. 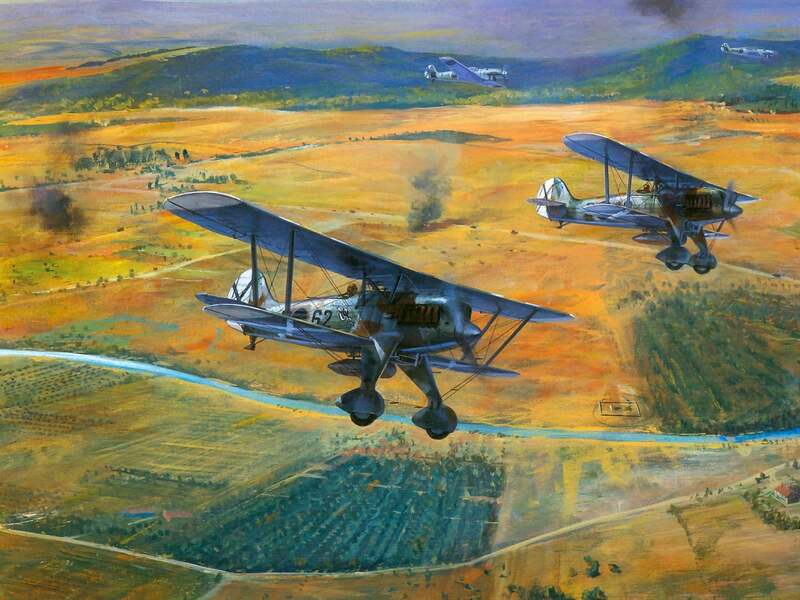 Then the planes of the first squadron was transferred to the North, where they participated in the battle for Santander. The longest Not-51 remained in the third squadron of the 88-th group. In July they were replaced by Bf-109С. Of the remaining cars formed a new, fourth squadron. During the battle of the Ebro air group Franco 1-G-2 suffered heavy losses and in July 1938, having in its composition only three serviceable vehicles, was withdrawn from the front. In its place arrived a group of 4-G-2 of the 28 fighters do Not-51-1, provoevavshy until the end of hostilities in Spain. Group 1-G-2 after the replenishment technique (eleven planes do Not-51-1) and staff received a new designation 2-G-2 and returned to the front. After the end of hostilities, the surviving Not-51 modifications and ferried to Madrid. It turned out that out of 135 such aircraft delivered to the rebels, there were only 46 intact. The loss of Franco was huge. The most severe suffered Non-51S-1 from groups 1-G-2 (2-G-2) and 4-G-2 from November 1937 to the end of the war. Losses from anti-aircraft fire totaled 19 aircraft shot down three fighters, four destroyed on the ground, two Not-51-1 crashed, 21 aircraft written off as beyond repair and one was captured by Republicans. Thus, from 51-51 s-1 at the disposal of the rebels remained only one car. As combat fighters Not Heinkel-51 was not used. Their place was taken remaining after the defeat of the Republicans by Soviet fighters I-15 and I-15bis. The company Ernst Heinkel Flugzeugwerke GmbH on the fighter jets began in the late 20-ies with the creation of aircraft HD-37. He already had the characteristic features of all future fighter-biplanes Heinkel with engine cooling. This characteristic lines of the engine hood of the BMW, and two-bladed propeller, and sturdy biplane box, and tubular welded frame of the fuselage. With minor changes in the design of the aircraft was copied in the USSR and received the designation I-7, in 1932, was launched into serial production to replace its aging fighter I-5 construction.Polikarpov. It turned out, however, that-7 special advantages of I-5 has not, and with the advent of fighter I-15 was withdrawn from production. Further development of the fighter 1-HD-37 was the aircraft HD-38 and HD-43, is being built in Sweden at the SAAB factory in Stockholm. The predecessor of the Not-51 is the plane is Not-49, created in November 1932. Under the Versailles Treaty, Germany was forbidden to have military aircraft, and all these cars were officially presented as a sporting aircraft. However for anybody not a secret that in a short time these machines could be converted into fighters. 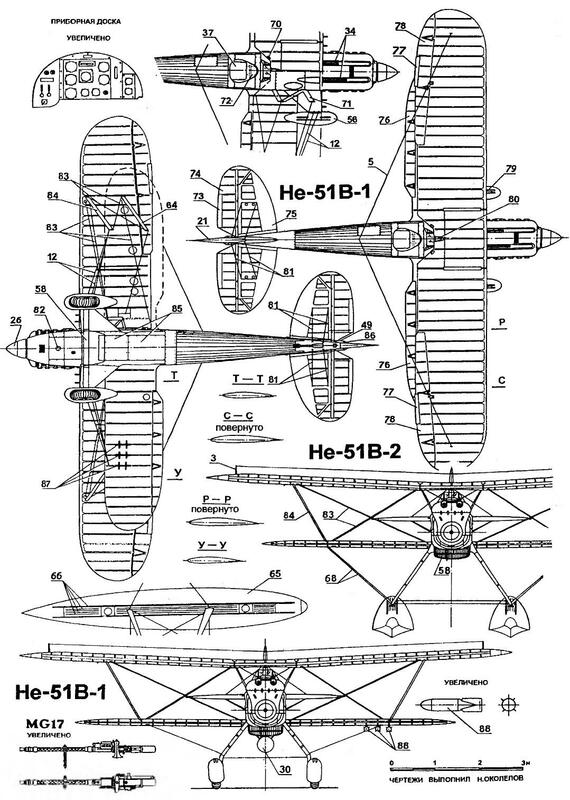 Not-49 was a biplane of mixed construction with a 12-cylinder inline water-cooled engine BMW VI. The fuselage of the aircraft had extremely clean, well-streamlined shapes, to the same airplane equipped with a retractable radiator. The first flight revealed some longitudinal instability, which in the second prototype eliminated, extending the fuselage to 380 mm. Constructors-49 Walther and Siegfried Gunther was not fully satisfied with the test results of three completed copies of this machine. Numerous modifications to the original project, led to the fact that the fourth prototype was a completely different plane. Hiding the military focus of the work, he was registered under the civil registration index Dilgy Lufthansa. In the summer of 1933 this aircraft received a new designation Not-51A. From 49 he was distinguished by the design of the ailerons, mount the upper wing, shape of the tail and a new undercarriage. In addition, the cabin appeared the fairing. In July 1933, the Not-51A made its first test flight. Pilot G. Nitschke was pleased with the flying qualities of the aircraft, but noted that the machine has insufficient maneuverability, and its administration requires considerable effort, especially in the channel Bank. The technical Department of the air force of Germany saw the development Not-51A with special interest, seeing in the new car a real competitor to as a “sport” plane Ar-65E. In the case that the combat qualities of fighter Heinkel will be better than the Arado machines, it is Not-51 was supposed to buy for the weapons part of the Luftwaffe. The prospect was encouraged by the firm Heinkel, so that the development of new aircraft has accelerated markedly, and in early 1934, at the factory in Warnemunde was released nine pre-series machines-51 A-0. Pre-production is Not-51 A-0 is very slightly different from the prototype are Not-51 A. So, they are missing a fairing for the cockpit and exhaust pipes of the engine were wearing extra-long S-shaped pipe to the exhaust pipes that got into the open cockpit. On the ailerons mounted trimmers. Armament consisted of two synchronised 7,9-mm machine-guns MG17. The fuselage had a welded tubular structure. The forward fuselage was closed with an easily removable metal panels, and the tail portion is trimmed with a blade. The wings and controls had a fabric covering. All nine fighters have received the appropriate civil registration indexes. In July 1934 the first of these aircraft arrived in Doberitz for testing in the composition Reklame-Staffel Mitteldeutschland, or “German Central demonstration squadron”. But the expected success did not follow. The pilots reacted to the new aircraft is very critical. Compared to AG-65E Ne-51 And was less maneuverable and very Moody, although its maximum speed was higher. There was even a few crashes. The pilots believed that their cause lies in the flawed design of No-51 A, but the management did not take into account the opinions of the pilots and took to the errors of personnel in the process of operation. Development plans of the Luftwaffe, which was formulated at the end of 1933, was intended to procure 141 aircraft Not-51. Firm Heinkel was not able to produce that amount of self — production capacity in Warnemunde was very modest. To solve decided to attract firms Erl Maschinwerk, AGO and Fisler. The first serial machines of No-51 A-1 left the Assembly hall warnemünde in April 1935. First, the rate of production amounted to four aircraft per month, and after connecting the other firms output reached ten cars per month. In 1935, the “sport” aviation groups began to translate into the category of combat units. Fourteenth of March, 1935, the squadron in Doberitz, still flying on the Ar-65E which was transformed into the first group 132 fighter wing (I/JG) “Richthofen”. During the summer, the regiment formed the second group, which is based in Gteborg-Damme. By the end of the year both units were rearmed with brand new No-51 A-ls, and fighters AG-65E moved into the category of training aircraft. This regiment was assigned and the young pilot A. Galland, future commander of the fighter aircraft of Germany, shot down during the Second world war, 104 of the aircraft. In Spain he fought on Not-51 pilot first member of the third squadron of the 88 groups of the Legion “Condor”, and then its commander. In the autumn of 1935 at the airport in Doberitz visited an officer in the British air force, which is in your report is very appreciated No-51, indicating that it outperforms the English fighter-biplanes Hard and Demon. In April 1935 on the occasion of Hitler’s birthday he was presented with twelve aircraft Not-51A-1 of the generated 134 th fighter regiment “Horst Wessel”, named in honor of the deceased author of the Nazi anthem. A little later, the new fighters came in 131st fighter regiment. Thus, in early 1936 Not-51 was in service with three combat units of the Luftwaffe. Until September 1, 1936 these aircraft wore a bright color, delighting the audience with numerous Nazi holidays with their colored hoods. In January — February 1936 in “Horst Wessel” received advanced fighters do Not-51-0. They differ from the modification A mounting chassis and the possibility of a suspension under the fuselage, additional fuel tank 170 liters Instead of the tail wheel mounted crutch, making the machine became more stable during the run. The first series of Not-51V-0 consisted of twelve machines. 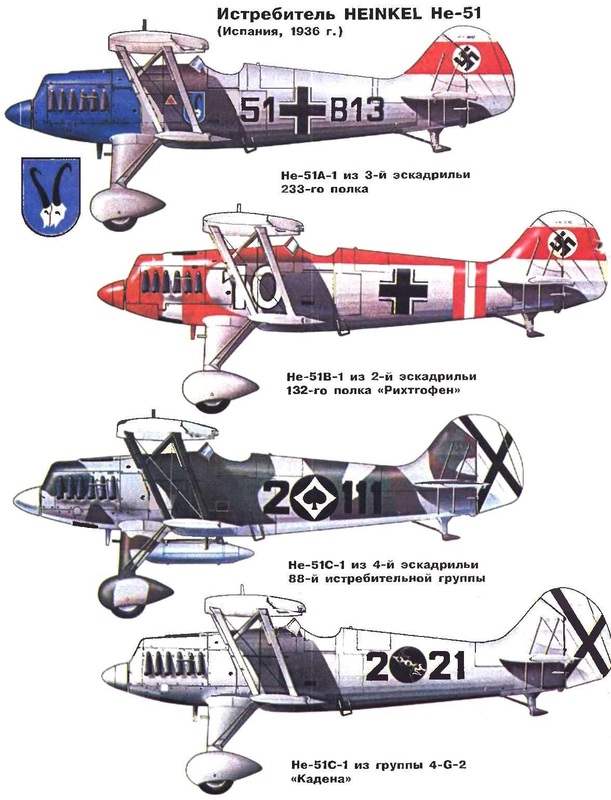 Aircraft of the second series of Not-51-1 was received in I/JG 132 in Doberitz, and then in the rest of the fighter units of the Luftwaffe during 1936. After that, all Non-51 A-1 was transferred to the 165th assault regiment, where they were equipped with six bomb racks and used as dive bombers. In the first half of 1936 released the modification is Not-51-2 with two all-metal floats for replacement of the obsolete fighters of coastal defense HD-38. All built by machines entered service with two squadrons of the 136th group of naval aviation in Kiel. The floats were tested on the plane-51A-2 (D-IFTI), released in a single copy. In 1936 the company of Heinkel proposed high-altitude version of the fighter Not-51V-3 with oxygen equipment and up to 2.7 m scale the top and 4.57 m of the lower wing. Built two prototypes of the D-IBAA and D-IDOG (second on floats — some sources passes under the designation of Non-51D). The second instance in the test process crashed, as first proposed for serial production under the designation of Non-52F, but the military no interest in him did not show. At the end of 1935, the Hungarian government tried to get in Poland, a license to manufacture fighter PZLP-24, but the poles refused. Learning of this, the E. Heinkel suggested that the Hungarians do Not-51 with the engine “Gnome-Rhone” 14KT. 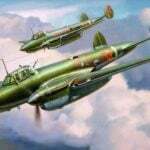 One plane was secretly showcased in Budapest, but the Hungarians still preferred him to the Italian fighters FIAT CR-32. In January 1936, Udet E., appointed chief inspector of the Luftwaffe, conducted comparative tests of the Ar-68 and Ne-51, which the firm Heinkel lost. As a result, the company Arado fighters were gradually replaced in combat units do Not-51. The latter was transferred to a fighter training unit (Jagdflieger-schulen), where they were used during the Second world war. 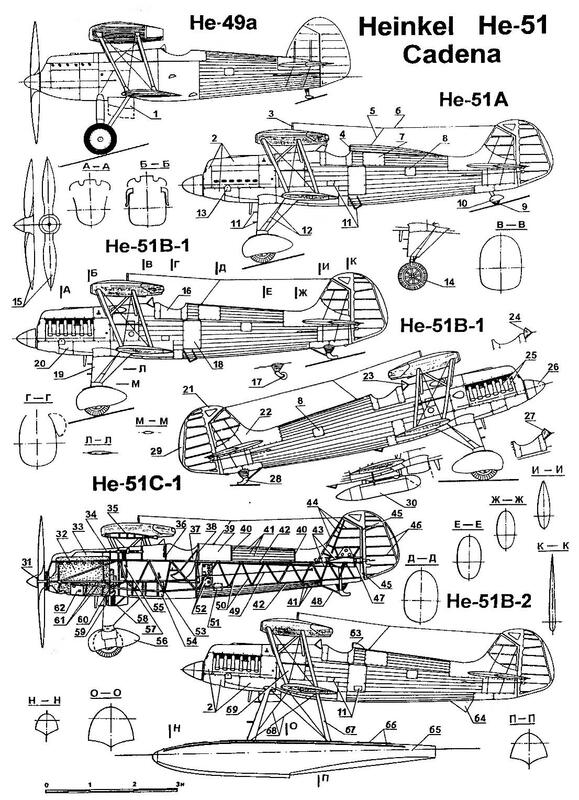 In addition to these modifications A and b, serially produced planes do Not-51 S. Modification of s-1 was built on the factories of the company Fisler specifically for the war in Spain. It differed from 51 In inscriptions in Spanish in the cab and six bomb racks for 10-kg bombs. Frankists was sent to 79 aircraft Non-51S-1, of which 28 were flying as part of the Legion “Condor”. In the summer of 1937 was released 21 unit float is Not-51-2 radios for replacement-51 To 136 in the first group of German naval aviation. The outcome of the civil war in Spain showed that in the second half of the 30-ies Not a fighter-51 is completely outdated. Adopted in April 1937, a programme for the development of the Luftwaffe was to have twelve fighter groups, Not the armed-51, seven more planned to arm the Ar-68. In the course of the war in Spain, the program has been completely revised with the aim of upgrading parts of fighter-monoplanes. In 1938, remaining in combat units do Not-51 was transferred to the created on August 1, the division air support, which consisted of Ar-66 and Not 46. Soon, however, these units were disbanded and Not-51 became a training machine. For all the time mass production was built 722 of the aircraft-51 various modifications. Several of Franco’s fighters do Not-51 was captured by Republicans, and one of them supplied by sea in the USSR. The tests took place in NII VVS. As noted Soviet test pilots, Not 51, in 1937, were already an outdated car and was lost for most of the characteristics of Soviet fighters. However, it was noted a number of advantages of the plane. It had excellent landing characteristics, stability in flight and ability to quickly pick up speed in a dive. Mechanics appreciated the excellent performance of the machine engine of which was recapturable in just three minutes, and high structural strength. Particularly noted the presence of the aircraft receiving and transmitting radio stations.